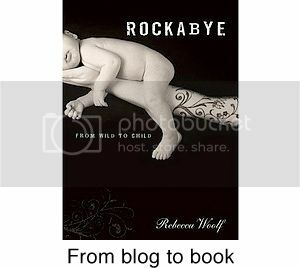 The following is another delicious guest post by WWW. Enjoy! I was all set to write about grain this week until today when I stepped into my garden after being in LA for two days. 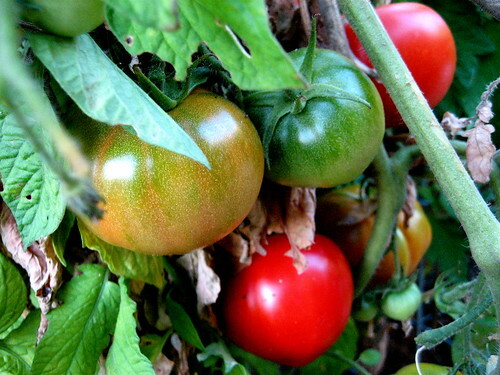 There, staring at me, were six pounds of plump, ripe tomatoes and several fallen green ones, begging to be eaten. I was immediately reminded of the 70's cult classic and decided I had better figure out what to do with all those tomatoes before they decided to eat ME! After picking two huge bowls full, I thought it might be fun to make an entire dinner with tomatoes so I gathered my cookbooks and set to work planning a tomato themed meal. Even if you don’t have a garden, cheap vine ripened tomatoes are plentiful right now at every farmer’s market so it’s a great time to cook with these luscious veggie-fruits. 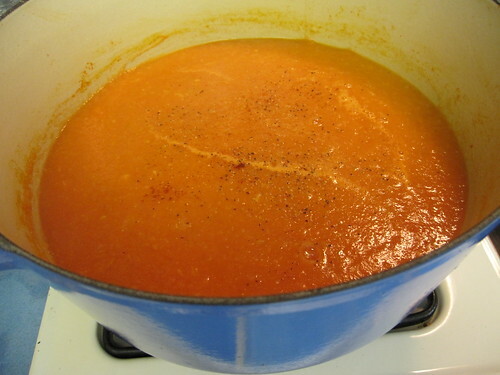 I know I already did a post about summer soup, but as I said before, I LOVE soup and tomato soup uses several pounds of tomatoes, which is a good thing when you have a lot of them. I thought it would be a perfect time to try my new cookbook, Love Soup, by Anna Thomas. 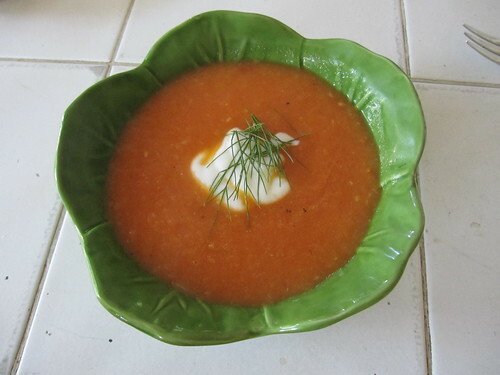 I happened to have all of the ingredients in the house for her tomato and fennel soup with blood oranges. This delicious soup is easy and quite filling for a light summer soup. 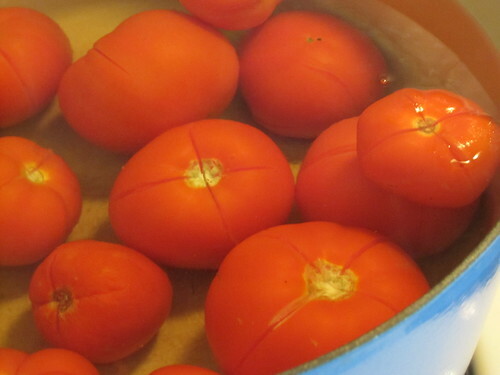 Cut crosses in the tomatoes with a sharp knife and scald them in boiling water for 1 minute, then drain, rinse with cold water, and slip off their skins. Cut the tomatoes into large pieces, saving all of the juice. 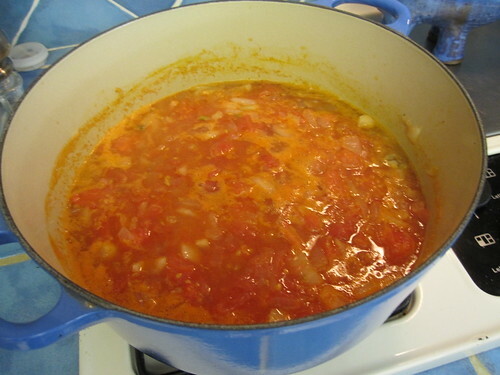 You should have about 5 ½ cups of cut-up tomatoes. Heat the oil in a nonstick skillet. Add the chopped onion and fennel, sprinkled with a big pinch of salt and some pepper. Cook the vegetables over medium heat, stirring often, until they are soft and golden but not brown, about 20 minutes. 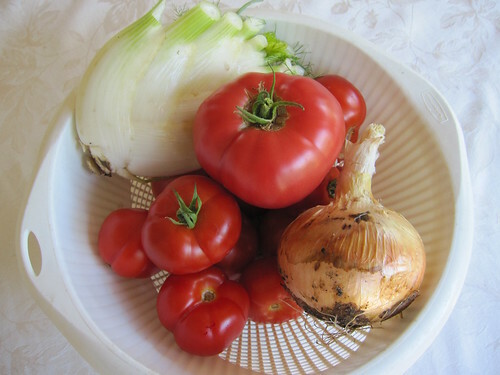 Combine the cooked onion and fennel in a soup pot with the tomatoes and their juice, a pinch of cayenne, the broth, and the blood orange juice. Cover the pot and simmer the soup for about half an hour, or until the fennel is entirely soft and the tomatoes have released their juice and turned dark. Allow the soup to cool slightly and puree it until it is completely smooth, either in a blender or with an immersion blender. Return the soup to the heat, bring it back to a simmer, and taste. Adjust the seasoning with additional salt and pepper if needed, and add a touch more broth if it seems too thick. Whisk the drained yogurt or creme fraiche with the sugar. 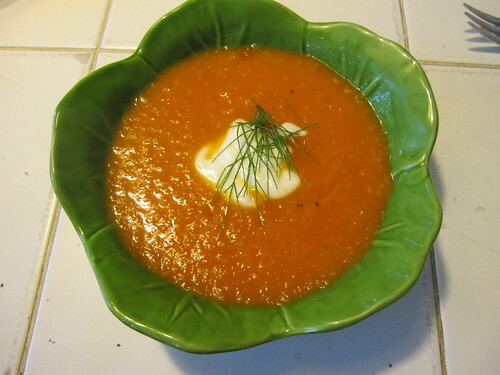 Serve the hot soup in shallow bowls and sprinkle a tiny pinch of grated zest over each serving, then drop a big spoonful of the yogurt in the center of the bowl and garnish with sprigs of fennel greens. 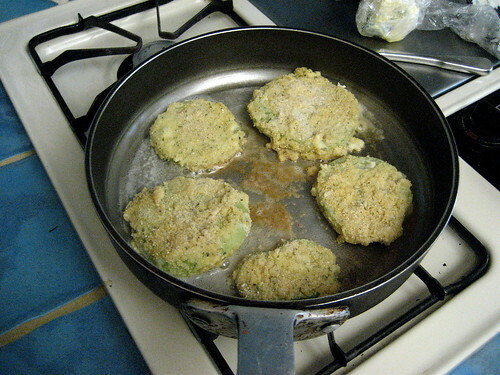 I wanted something I could whip up while the soup was cooking and since several green tomatoes had dropped off the vine, I decided to make fried green tomatoes (I must have movies on the brain today!!). This is a very easy main course to make and is a great substitute for meat since green tomatoes have a pungent tang to them. 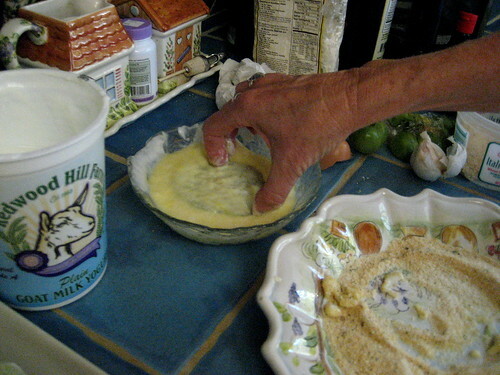 Beat eggs and buttermilk* together before coating tomatoes in flour. Then dip tomatoes in egg/milk mixture. Dredge in breadcrumbs or cornmeal. Heat oil or butter in pan until hot. 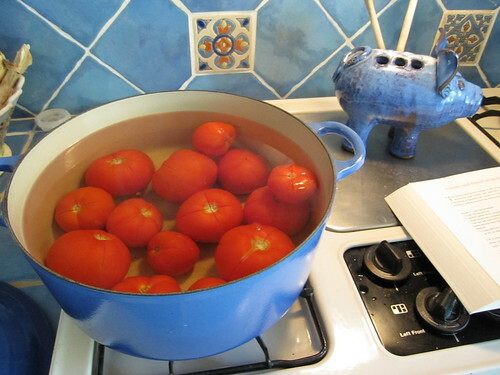 Fry tomatoes in batches until golden brown on both sides. For my final dish, I made a simple caprese salad…sliced tomatoes topped with buffalo mozzarella, fresh basil leaves, drizzled with good quality olive oil and salt and pepper. I am sure you must be thinking I am crazy to make an entire dinner of tomatoes, but honestly, each dish tasted so different that we really didn’t notice that the entire dinner was made from tomatoes. I think, though, tomorrow’s harvest will be shared with the neighbors and I will go to the movies! *I substituted buttermilk with (goat milk) yogurt and it was delicious! Recommended! 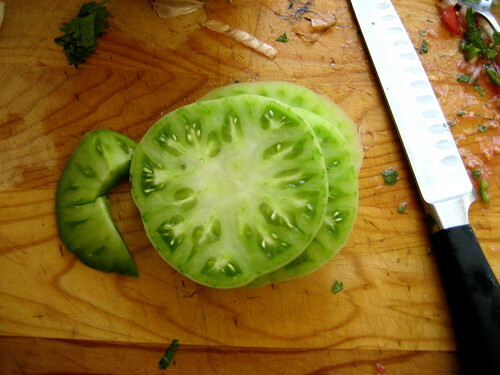 On the Fried Green Tomatoes...... 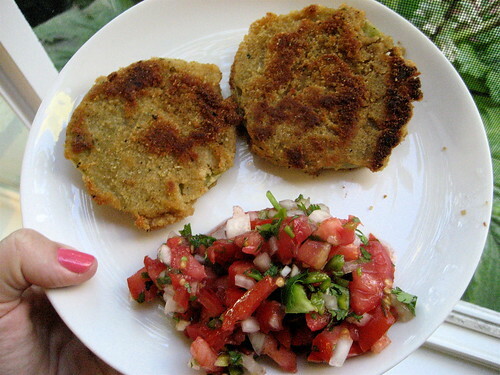 I use falafel instead of the bread crumbs and it's DELICIOUS!!!! I am confused...falafels are the balls. Do you mean chickpea/garbanzo flour? Or are you using a falafel mix? This is a great idea! o my gosh, www. you are incredible! Can I just say that I am LOVING your entire series of food posts and that I hope it never ends? We've been trying to eat more vegetarian (though not entirely), and your posts have been more useful to me than any cookbook I own, veggie ones included. The realistic (not over-stylized, like most cookbooks) pictures are fantastic and make following the recipe easier when I'm trying to do things quickly with 2 kids underfoot. I guess it's Girls Gone Child (or WWW) week at our house, because so far we have had: the quinoa/blueberry salad, the chiles rellenos, and the quinuevos rancheros, and we're slated to make your falafel balls, too. Oh, and I made the crispy kale, too. 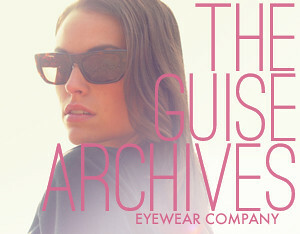 Everything has received rave reviews so far. Keep up the excellent work! Thanks so much, and I'll have to try some of these tomato ideas next week. One question: I bought dried garbanzos to start w/like you suggested, but other than cost, is there a reason that starting w/canned garbanzos wouldn't work (for the falafel thingies)? Gosh, Kate. Thank you so much for your comments! You can use canned garbanzos...just rinse them well and dry them off. They work great! You can also use garbanzo flour (I included a link for that recipe). Sorry for the confusion...ya, I meant the dry powder falafel mix that you can buy in bulk or in boxes. It gives so much yummy flavor. Thanks for the great posts!! I love tomatoes. Oh they are sooooo good. Awesome recipe!!! LOVE IT. I had no idea what to do with all of my tomatoes. YOU ROCK! 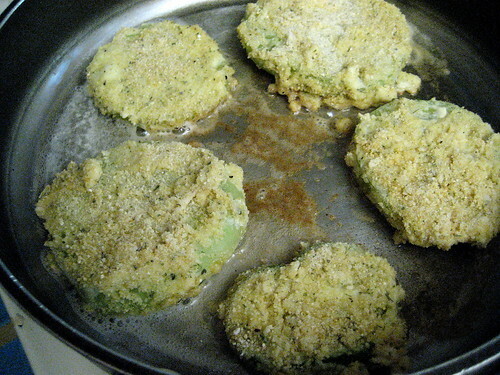 We have lots of green tomatoes and I had just been thinking about finding a fried green tomatoes recipe, so thank you! Such a great series. We're big fans of the crispy kale at our house now, too! Wendy, did I miss your salsa recipe? That looks amazing. Is it just chopped tomato, cilantro, seasoning, lemon or lime juice? I just have to say I love the tiles in the kitchen! Every time I see one of your posts I start to get the itch to redo my kitchen. Thanks for all the great ideas food included. Salsa...tomatoes, cilantro, chopped peppers (I used Anaheims of course!) Chopped sweet onions,garlic and that's it!! 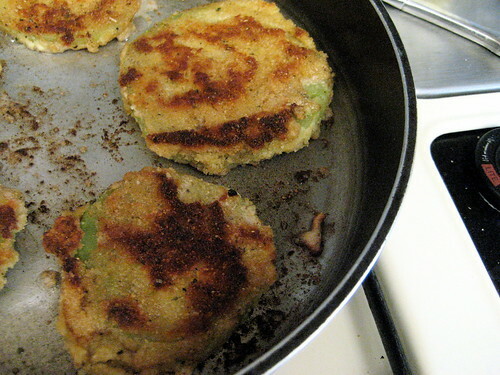 I'm so glad you posted a recipe for fried green tomatoes. My MIL is growing her own and we were keen to do this. I'm so glad tomatoes are getting some love. Usually the tomatoes in the US are those big beef tomatoes that are grainy and flavorless, and so many people say they don't tomatoes because those are the only kind they have had! There are so many yummy varieties! I love the tiger striped ones the best. Which I'd highly recommend - it's brilliant! 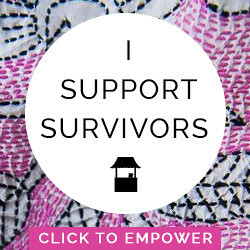 i am loving these www posts! i get together with two of my girlfriends (and baby daughter) every tuesday night for marathon cooking and baby-holding. that way we get a bunch of cooking done for the week ahead of time and it's also actually fun. 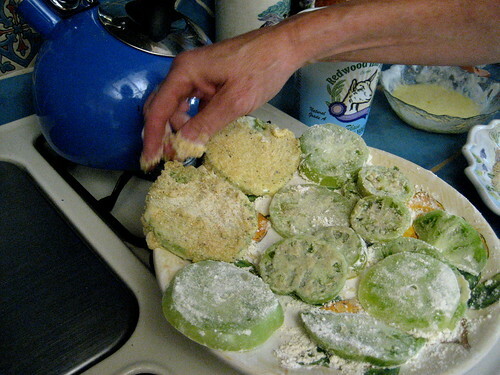 anyway we have used several of your recipes, most recently the chiles rellenos, and they have all been huge hits! i just love your writing and recipe style. thanks! Wow, Auglaise...that sounds amazing! I will have to try it. Thanks! Are you sure you want to award a TARGET GIFT CARD? Oh my! I have so many tomatoes in my garden right now! This is perfect! Thanks for your concern, Anon. This is a HUGE concern of mine, too. TRUST ME. 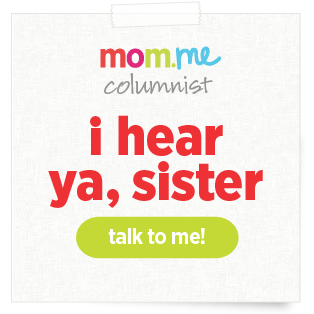 I've spoken to my friends at Momversation about this and we're dealing with it. Working with sponsorships is muy complicated. These recipes have inspired me in my own kitchen! And I love that you're cooking from your own garden. I blog about eco-friendly makeup and fashion for a blog called BeautyXpose, and eating the right foods is part of being eco-conscious. I love finding ways to cut down on meat and increase my intake of organic veggies! 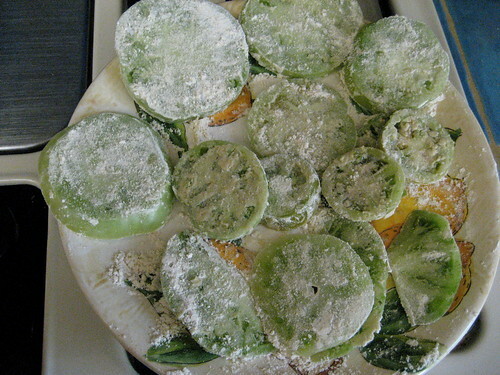 I make fried green tomato sandwiches with fresh basil and smoked gouda. The smokey flavor of the cheese mixed with the crunchy tomatoes almost make you think you are eating a BLT. As a vegetarian who misses bacon, this was a wonderful find! And I thought I was completely in love with you before. That was a truly impressive response, GGC. Thank you. Tomatoes prepared three different ways is a dream meal! I was wondering why take the skins off of the tomatoes? 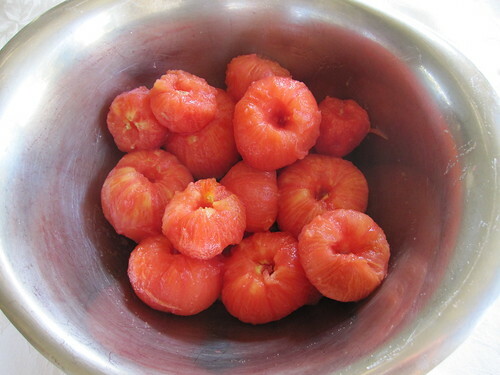 I usually don't (out of laziness), but have also hoped that the skin add nutrients and fiber. And now I want fried tomatoes. YUM!!! Random. So random. Random town. There's a Steven Slater in all of us?